Few places capture the imagination quite like the Trona Pinnacles. 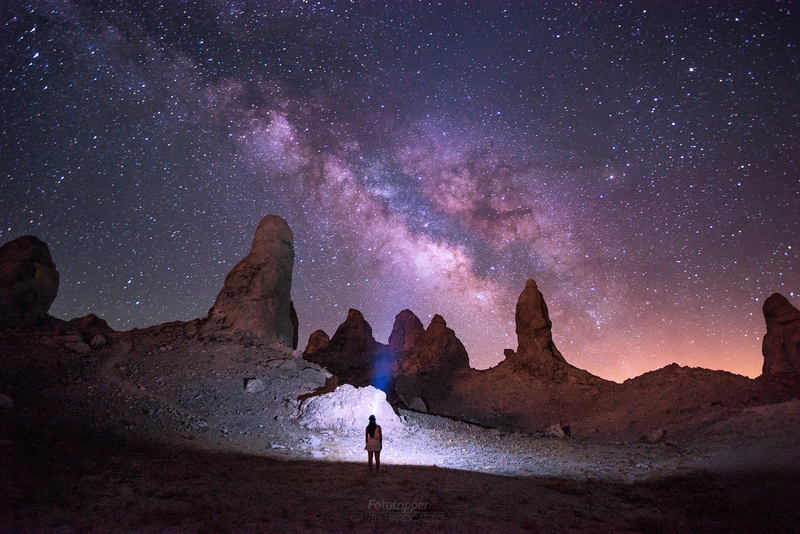 Situated in Southern California just 10 minutes from the town of Trona, this otherworldly landscape of tufa spires offers the photographer endless photo opportunities, day or night. As you drive up to the pinnacles you’ll be forgiven for thinking you’ve been magically transported to some alien planet and that’s exactly why the Trona Pinnacles have been featured in so many Sci-Fi movies over the years. It’s such an epic place for photographers that I feel it’s worth extended study. Personally I could spend an entire week just at the Pinnacles but it doesn’t hurt that you can get to Death Valley within a couple of hours. During a summer trip to Death Valley, I made a special trip to the Pinnacles specifically to capture some Milky Way shots and I was not disappointed. Although not a totally dark area, it’s still plenty dark enough to see the Milky Way in all it’s galactic glory. There’ll be some glow from the towns of Trona and Ridgecrest but if anything that can add some nice horizon contrast to your shots. If you’re planning on doing some astrophotography at the Pinnacles, it’s a good idea to first check the place out in daylight so that you can familiarize yourself with the rough roads that weave in and out of the pinnacles. You can literally drive right up to them and even use your car headlights for a bit of light painting. If you’re driving from Trona you won’t see the sign for the Pinnacles because it’s on the other side of the road (Hwy 178) facing the traffic from the South West. Just look for the first dirt road turning left after you’ve left town. From Ridgecrest, drive North East on the 178 for just under 30 mins. You’ll see a sign for the Pinnacles on the right and you’ll take a right turn on a dirt road immediately after it. From the dirt road you cross the railway tracks and follow the road to the right. You can see the Pinnacles from there. I do a lot of night shooting in super dark areas but I’ve got to say that the Trona Pinnacles is one of the creepiest astrophotography places I’ve ever seen. 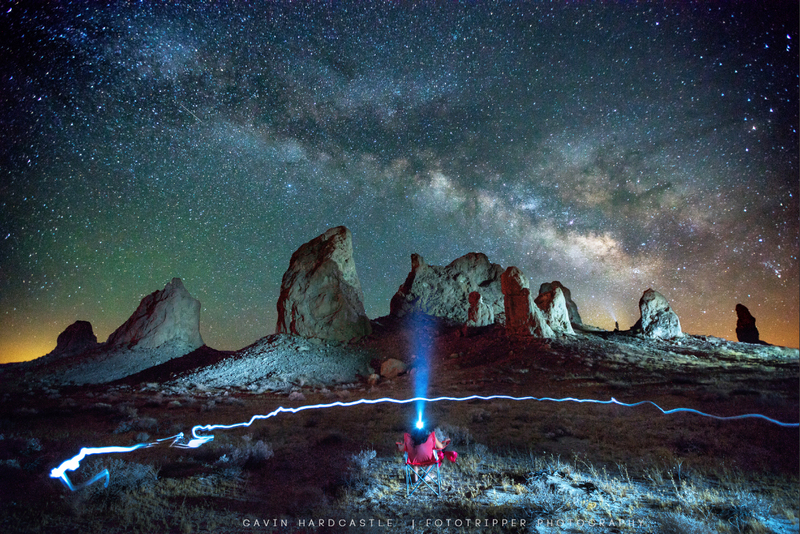 I’ll think nothing of shooting for hours in the dark woods with large predators all around me but the Trona Pinnacles gives off a strange vibe I can’t quite describe. That creepy vibe makes the Pinnacles irresistible and I think it comes across in the pictures too. Subscribe to the Fototripper Newsletter and get news on my latest tutorials, reviews, photo guides and more straight to your inbox. Other than a helicopter that kindly came and lit up my scene, we were the only people at the Pinnacles in mid June. I’ve heard that beer guzzling kids sometimes go out there at night but in terms of finding a scenic spot to take pictures without hordes of other photographers to deal with – the Trona Pinnacles is as good as it gets. Hopefully this article won’t spoil that and the heat might dissuade all but the most committed photographers. It was 35° Celsius at night in June and gets very hot during the day. I can’t imagine being there in the heat of August. The road that connects the highway to the Trona Pinnacles is a dirt road but it’s manageable in most cars. Once you get to the pinnacles I’d leave the car by the information boards if you don’t have 4X4 with high clearance. We were in a full sized truck with 4X4 so we could tackle some of the rougher trenches but I wouldn’t want to try that with a normal car. If the worst comes to the worst and you break down it’s not too far to hike to the town of Trona but bring plenty of water. If you’re not used to extreme heat you need to prepare yourself. This is the Mojave desert and it cares nothing for the unprepared. As soon as you step out of your vehicle you can feel every drop of moisture in your body being sucked out by the desert heat. Bring 5 times more water than you think you can drink. We had a large water container on the back seat with a faucet and filled it with ice. I think we’d have perished without that. You’ll find the best accommodation in the town of Ridgecrest which is about 30 minutes East of the Pinnacles. We stayed at the Super 8 which was nothing fancy but decent enough for us. We had a good meal at ‘The Grape Leaf’ which serves Greek/Mediterranean food. After a week of eating burgers and standard American fare this was a blessed relief. Trona is really not that far from Death Valley and other epic locations in the Eastern Sierra such as the Alabama Hills and the nearby town of Lone Pine. Further North you’ll find the Bristlcone Pine Forest near the town of Big Pine as well as The Devils Postpile and Mono Lake further North still. 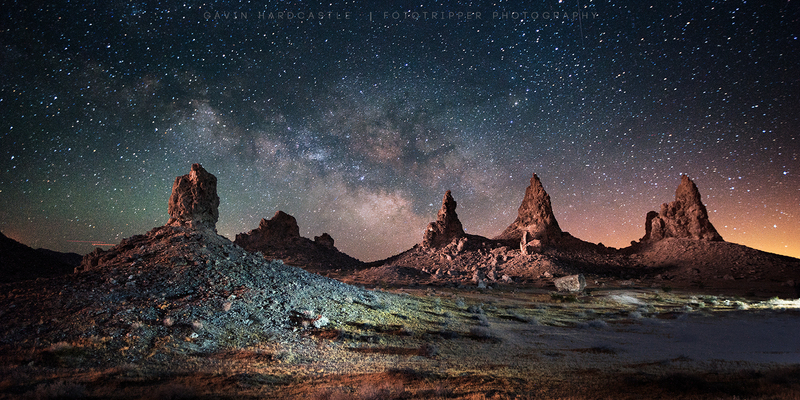 Sunrise, Sunset, Moonrise and the dark of night are all excellent times to photograph the Trona Pinnacles. It gets so hot that I’d avoid shooting in the middle of the day while the light is too harsh. 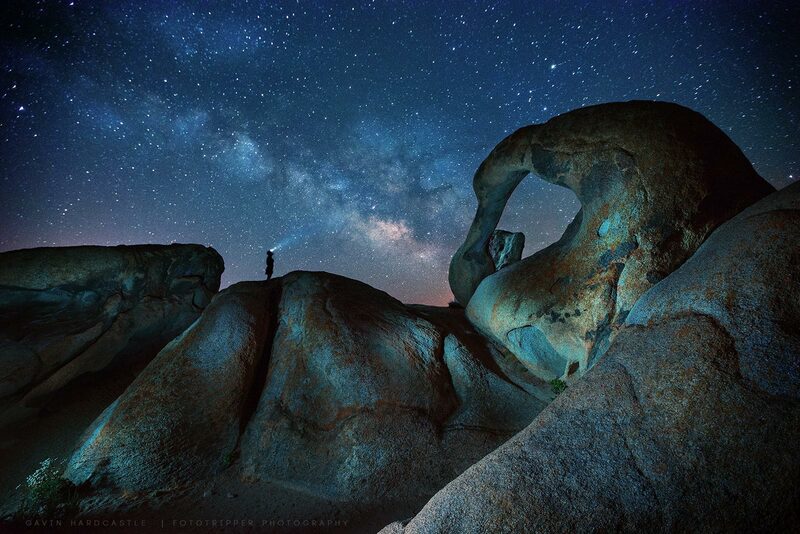 Seasonally, you’ll find the best Milky Way shots during June to August when it’s most hot. 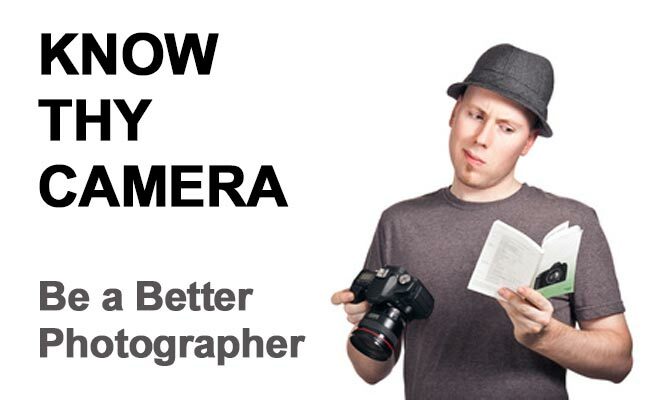 If all of your gear is not weather sealed you might consider bagging up and wearing a rain sleeve on your camera. It can get windy and there’s a lot of salt and dust flying around. I found that after shooting in the hot desert for a week my Sony A7R was actually having mechanical problems such as the shutter seizing and the lens adapter failing to send aperture information to the camera. If you need to change lenses be sure to do it in a vehicle with the windows up. Those hot gusts of wind can really catch you by surprise. Sensor Cleaning Kit – Even if your camera is weather sealed, dust WILL find it’s way on to the sensor. Make sure you bring a full sensor cleaning kit and be prepared to use it more often than you’d like. Cell phone in case you get a flat tire. The road is pretty rough.